Pix:Ritu Raj Konwar .The Subansiri(Obonori) river where the proposed 2000 MW Hydel Project by NHPC is under-construction which is slated to be complete on 2012 The central government's proposed decision to build as many as 180 mega dams in North Eastern region is a dangerous move without assessing and properly studying about the long term fragile impact which may proved to be a major catastrophe in the future in NE India region.The Northeast Electric Power Corporation (NEEPCO) Hydel Project of Ranganadi near Lakhimpur has already proved peril to the people of that region destroying large number of lives and property as well as rendering hundreds homeless during the last year's monsoon season. The Lower Subansiri Hydel Project,which is presently under construction by National Hydel Power Corporation (NHPC) with an aim to generate high 2000 MW in Gerukamukh in the adjoining Dhemaji district and Lower Subansiri district,if completed ,shall be no exception. The construction of such high powered dams is bound to compound the problem of floods and erosions in the river banks,ecological imbalance,decreasing of soil fertility,loss of forest andaquatic resources,extinction of varieties of flora and fauna,resulting unimaginable natural disaster. in the entire downstream region of Subansiri river. The constructon of mega dam in Gerukamukh is also a threat to the existence of inhabited Majuli Island,which is also one of the world's largest riverine island.Besides,there are many ''hidden threats'' such as it will affect the fishing communities who depends on the river for their livelihood and forced displacement of the Mising tribe as well as other indigenous communities from their habitat who lives along the banks of Subansiri river. If the regular flowing of water is compromised,the entire landscape of the river banks would also be transformed instantly. 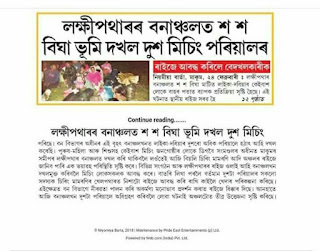 The earlier report of Environment Impact Assessment (EIA) prepared by a team experts hasn't able to gained the confidence of the local populace,it was a biased report in order to satisfy the corporates needs only.The ethnic Tani student organisation Takam Mising Porin Kébang (TMPK) including All Assam Students' Union has launched a number of agitations demanding reassesment and halting of the hydel project.The recent announcement for another assessment report should take into account the forseeable disasters and other significant impacts .The proposed mega hydel project in Lower Dibang Valley,with an estimated 3000 MW in Arunachal Pradesh also the country's second largest proposed dam , has already been objected to the construction of mega dam in the region,fearing displacement and outnumbering of the local ethnic Idu Mishmi tribe's populace by outstation workers.The Siyom Hydel Project (1000 MW), which is being proposed to built in Upper Siang district of Arunachal Pradesh by Reliance corporate,is too facing similar protests from the indigenous Bori clan of Adi Tani tribe,who also depends on forest resources and fishing for livelihood in the place. Again,the recent agreement of Arunachal Pradesh government with one Jindal corporate for the contruction of 4500MW over Dibang river in the upper course has been flayed by number of organisations in the respected state as well as in neighbouring Assam.The prominent student organisation All Assam Students' Union has joined hands with the ethnic student organisation TMPK recently on August 3,2009 and announced a series mass protest movements demanding adequate safeguard to life and property of the people living in the downstream areas of the mega hydel projects.The proposed 1500MW Tipaimukh dam in Manipur has also evoked protest from the people of India as well as Bangladesh.Due to huge protests,the Tipaimukh hydel project issue has prompted the two countries to hold parliamentary delegation meetings. The entire hydel projects in North East will proved costly and bring about untold sufferings not only to the present generation but also to thefuture generation to the people of the region in the long run .The mega projects which are being constructed to provide back up to the developing economy of India will lead to huge disastrous impacts both natural as well artificial ,not only to the country,but also to the entire world that would result in global warming and climate change.It is high time that the centre rethink the proposed building of such a huge number of mega hydel project in the region realising the long term affects and act in the greater interests of the people.The hydel projects are also dubbed by the local press and people as hydro-bombs in NE India.The hydel projects of Northeast India won't help to prosper but are major disaster-in-waiting for the netizens of the region.